​The pioneering rapid prototyping process of stereolithography is an excellent solution for outstanding surface smoothness, feature resolution, edge definition and tolerances that rival those of CNC-machined parts. 3D Systems was one of the first developers of commercialized SLA 3D printing, and with those years of experience comes trusted machines. We use 3D Systems' 3D printing machines to offer our clients quality SLA solutions for both rapid prototyping and rapid manufacturing. Our SLA machines can build accurate parts directly from 3D CAD Data. This data is used as a guide by which a UV laser cures liquid material in your desired part. 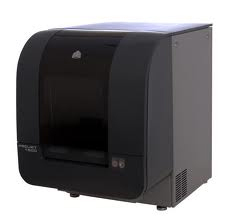 Our Machine of choice at 3D Printing Services Canada is the iPro 9000 from 3D Systems. One of the top of the line SLA systems on the market, this 3D printer produces outstanding results even for large builds. This production capacity machine is the perfect solution for rapid manufacturing, and by outsourcing to 3D Printing Services Canada you save yourself a large capital investment on the machine, and maintenance costs. This full line of materials gives you the capability to produce durable models, that can withstand even the highest degree of testing. SLA prototypes are often used in engineering industries due to their durability. For instance, the automotive and aerospace industries work with SLA prototypes for heat resistance and smooth finishes that permit wind tunnel testing.